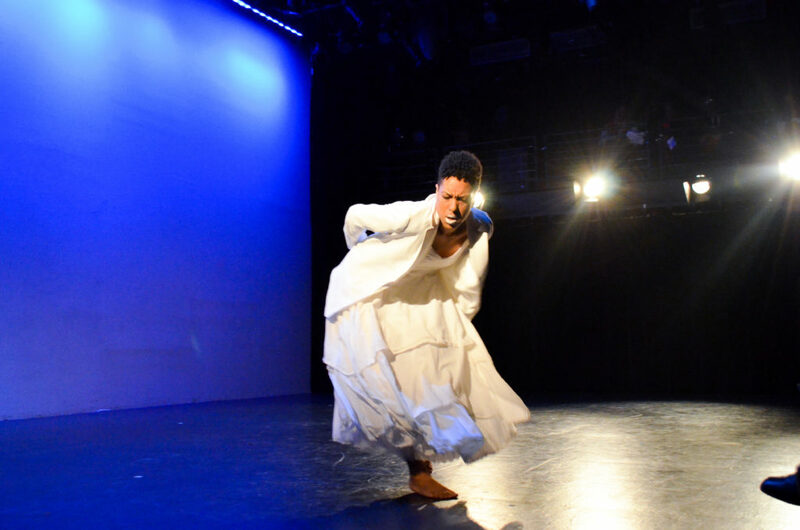 From May 2-4 and 9-11, 2019, Harlem Stage’s signature dance series E-Moves celebrates its 20th anniversary. Throughout its history, E- Moves has commissioned, presented and nurtured choreographers of color across the spectrum of contemporary dance idioms to create new work. In celebration of this anniversary, Harlem Stage will present 6 nights of dance featuring 2 commissioned artists presenting new works. In addition to the 2 new works, each night will feature additional choreographers and a pop-up performance by up-and-coming choreographers. For the 20th anniversary season, the cogent power of Hip-Hop dance is uplifted to transport the crowd and push the boundaries of movement.Born out of social dance in urban community park cyphers and basement ballrooms and now seen across the globe on esteemed stages and concert halls, Hip-Hop dance is a prayer and a roar. Two commissioned choreographers, FLUXX and Omari Mizrahi/ Les Ballet Afrik will present new works. E-Moves choreographers also includeIt’s Showtime NYC!, Joseph Webb and Barédu Ahmed aka Long Arms (L.A.) and pop-up performances curated by Adesola Osakalumi, including works from Sun Kim, Cein Lockefeller, Soraya Lundy and TweetBoogie. “FLUXX” aims to capture a Black woman’s life, which has always held the seed of sprituality. This works cuts into that seed as an interrogation of personal memories and those of mothers, grandmothers, and great grandmothers. This is a story of two women connecting past to future through memory and aims to capture the dissonance between the difficult internal dialogue to reveal tireless beauty and strength. “Messages from Umi” is the story of The Order of Long Arms (L.A.), keepers of the culture and the seers of the future, guarding ancient prayers and meditations in a sacred temple of words, beats, movement, and culture. The title is a reference to Umi, traditionally understood as a term for mother, and represents the messages transferred to the legacy of Hip-Hop from the ancestors through Mother Hip Hop. “Messages from Umi” expresses Hip-Hop as a prayer through live music while exploring sound, emceeing, and movement through tap dance and house dance. A Hip-Hop celebration of funk and love. “Sila Djiguba” is an amalgamation of West African, AfroBeat, House and Vogue styles. Featuring 8 dancers, the piece honors the dance circles or “ciphers” that bring people together during a time of celebration, whether it be a wedding in the villages of West Africa or a classic game of “Pass the Beat” at a vogue ball in New York City. Inspired by non-verbal exchanges, which occur when people from different walks of life engage within a cipher, Omari’s ” Sila Djiguba” showcases how traditional dance steps are reinterpreted through various dance styles and passed down to generations to come. “Crossroads” is inspired by relationships in all their forms and how people use them to understand themselves. The work moves through abusive relationships, community circles, and mentorship, to contemplate the choices one makes and where each road leads. Created by Faustin Linyekula (Democratic Republic of Congo) and Moya Michael (South Africa) and in collaboration with 22 dancers from It’s Showtime NYC! during a two-week residency at BRIC and University Settlement in 2017, “Festival of Dreams” celebrates the small, personal details that define who we are and connect us all as human beings. Paying homage to Bad Boy Records who changed the sound of Hip-Hop and R&B in the 90’s along with fashion and culture.